The story of how Matthew Murray established his engine works in Leeds, and with it how the Leeds engine building history began, sounds at times like a fairy tale. Indeed, in two centuries of the story being re-told with limited documents from the early days may have coloured it a bit. Matthew Murray is thought to have been born in Newcastle in 1765. His father encouraged him to take up an engineering career. He married before his apprenticeship was completed and moved to Stockton on Tees where he completed his apprenticeship and became a journeyman for a local mechanic. The term "journeyman" goes back to the old Guild system. On completing their apprenticeships craftsmen would travel from town to town practising their craft, paid by the day (jour), until they were ready to submit their "masterpiece" in the hope of becoming a master of their craft. It seems that this practice hadn’t entirely died out as that is exactly what Murray did. He may have worked on machinery for a Flax Mill in Darlington during his time in Stockton. It is probably through this that he heard talk of Leeds Flax Mill owner, John Marshall, seeking to similarly mechanise his mills. Figuring he had much greater prospects in Leeds he decided to move here in 1788. With little more than his bag of tools and the clothes he stood up in he set off on foot to Leeds, promising to send for his wife when he had raised money for her to make the journey. On arrival in Leeds he sought accommodation at the Bay Horse Inn in Chapletown. Unable to pay for the room he convinced the landlord to give him a room by showing him his tools and assuring him he would soon find work. The following morning he walked to Marshall’s mill in Adel where he did indeed find work, initially just doing odd jobs. However he soon proved very useful in working with the water powered mill machinery and he became chief mechanic. Marshall presented him with £20 for the improvements he made to the machinery. With this money he sent for his wife and they moved into a cottage near Adel. The Flax spinning industry was booming and the mill at Adel soon proved too small. Marshall, with new partner Benyon, established what would become a massive complex of mills in the Holbeck area of Leeds. Setting up the works involved a great deal of work by Murray including making his own design of spinning machine. Power for these machines was provided by a waterwheel fed by steam engine (various sources disagree as to weather it was a Newcomen or a Savery engine). Just a few years later this set-up was replaced by a 28hp Watt engine. Murray patented a number of improvements to mill machinery, most notable was "Instruments and Machines for Spinning Fibrous Materials, e.t.c. " which introduced the revolutionary "wet spinning" of flax. With a number of other mills being established in the area there was great demand for machinery such as Murray’s. In 1795 he went in to partnership with David Wood and established a business making machines in rented buildings in Mill Green, Holbeck. The success of this enterprise led to him being joined by wealthy colliery owner James Fenton and the establishing a new works in Water Lane, Holbeck just a few years later. David Wood concentrated in the day to day running of the works and was involved in designing some of the mill machinery they produced. Matthew Murray was keen to work on steam engine design and this would prove to be the company’s valuable contribution to the industrial revolution. 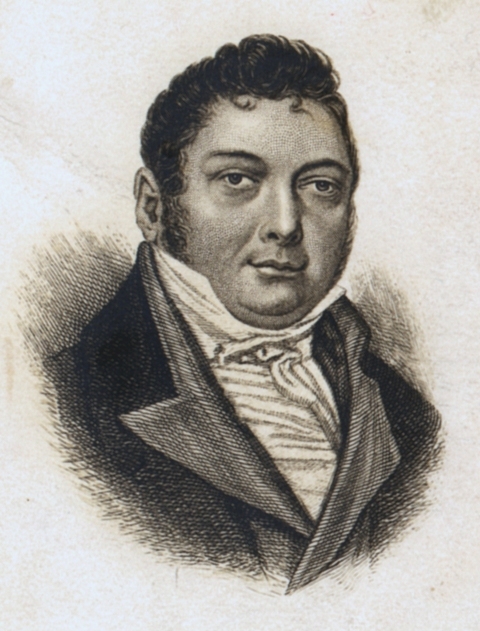 Matthew Murray was particularly keen to develop compact engines. 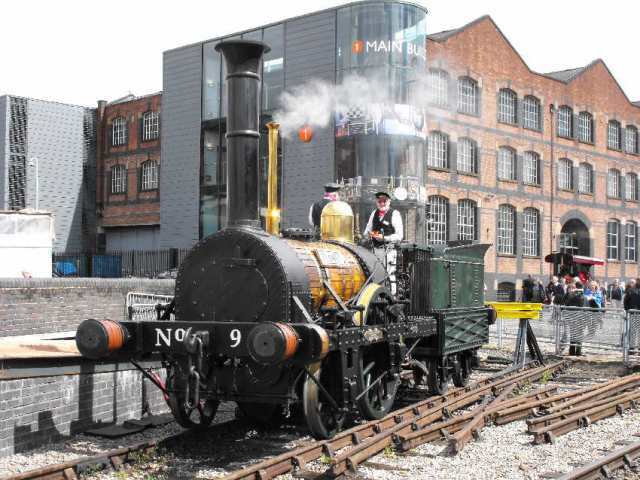 Previously steam engines were massive constructions often incorporated in to the mill buildings they would serve. Problems with engines in kit form being set up incorrectly in their buildings was common. New designs were developed, the most compact is this A Frame engine of 1805, seen below. It is preserved in the Birmingham Museum of Science & Industry. Note the unusual means of converting linear to circular motion. At the time the usual method of using cranks was patented by Birmingham button maker James Pickard. Rather than pay to use this design Murray invented his own "Cycloidal straight line motion"
A number of improvements to steam machinery were also developed by Matthew Murray. He improved on the design of the steam valves, developed a mechanical stoker and a device for regulating the draught on the fire. Very early into the company’s existence they had attracted the attention of the Birmingham firm Boulton & Watt. Murray’s work on steam engines would cause a bitter rivalry between the two companies. The first contact with Boulton & Watt was back in 1799 when they visited his works and others in the area. They were particularly interested in his castings as this letter from Boulton to James Watt Jr on 17th January 1799 shows. "Murdock & Abraham are now returned from their excursion highly delighted and full of panegyricks upon Murray's excellent work. Abraham is now entirely convinced of his inferiority, and what is more, of the possibility of amendment and he is now actually making trials of different substances to mix with the sand with the view of giving a better skin to the castings. We have likewise written to G. Mc Murdock to send a boat load of the sand used by Murray"
"Mr. Storey (Abraham), manager of their Foundry, and Wm. Murdock, Superintendant of the Workmen at Soho, some time back visited our works at Leeds, and from their assuring us of Messrs. Boulton, Watt & Co.'s friendly disposition, were admitted into every part of the manufactory, by Mr. Wood and myself; they were permitted to take patterns and specimens of our workmanship, and we know that upon their return to Soho, many of our Improvements were immediately adopted, and the engines made after that by them, were in part constructed on our plans. Mr. Murdock upon taking his leave of us, expressed a wish, that as they and we were certainly the best engine makers in the kingdom, we should always be upon good terms, and that if ever I should go to Soho, they would be very glad to shew me all their works. I did go to Soho, and was refused admittance into their Manufactory of Steam Engines." "I have been surveying the environs of this rival Establishment & making enquiries respecting the property & tenure of the neighbouring lands, with a view to seeing whether we could purchase any thing under their very nose that might materially annoy them & eventually benefit ourselves. A former Boulton & Watt worker who had moved to Leeds and had taken up work with Fenton, Murray & Wood was encouraged to return to the Birmingham firm and attempts were made to coax back others, primarily so they could extract any knowledge of their Leeds rivals from them. They were happy working for the Leeds firm and one of them only returned to Boulton & Watt as his wife hadn’t taken well to moving to Leeds and her health was suffering. On his return however, Boulton and Watt had other ideas. It may then become a question of policy whether we should take him back or leave him for some time as a spy upon Murray & Dixon's (another ex Boulton & Watt employee occasionally referred to) proceedings. James Watt Jr tells [Matthew] Robinson Boulton on the 14th June 1802. Dixon had been encouraging other staff from Birmingham to defect. One of them was found to be in possession of drawings of Boulton & Watt machinery when James Watt Jr broke in to a trunk in his bedroom. Involving the police was considered at this stage, however since it was a drawing he had produced himself no theft had actually taken place. Boulton and Watt would very soon use the law against Murray though. On the site they studied the works themselves in great detail. Though no doubt these actions of Boulton & Watt were a great annoyance at the time they are invaluable for documenting the history of the works as much of what we know these days is based on James Watt Jr’s notes and letters. 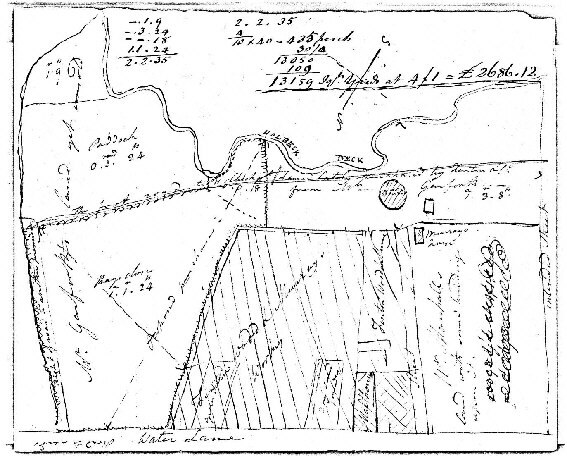 Above – A sketch by James Watt Jr of the Fenton, Murray & Wood works with calculations regarding potential land purchases around the works. "Fame has not outdone the magnitude of Murray's new Edifice, it is a rotundo of about 100 feet in diameter with a magnificent Entrance. The Engine is to stand in the middle and the lower rooms to serve as deposits for Engines & other finished goods. The Upper rooms to be for fitting. It is an excellent building & will not look amiss. It is up to the top of the 2nd storey. I will make a better sketch of it before I leave Leeds than this, but am now much pressed for time." "The world, I believe, cares very little about Messrs. Boulton, Watt, and Co. stealing my inventions, or my stealing theirs; what people want of us, are good engines. Indeed that is what both firms continued to do, and though Boulton & Watt retained their land in Leeds and no doubt continued to spy on their rivals there is little more written of the goings on at the Round Foundry. As well as the Rotunda under construction in the above sketches another interesting feature of the works complex is Matthew Murray’s house, shown a short distance from the Rotunda. The significance of this house is that it was the first to use steam filled radiators for its heating. Mathew Boulton’s Soho House near Birmingham, and the houses of a number of influential figures of the Industrial Revolution had central heating systems. These buildings however used conduits for circulating hot air, a system dating back to Roman times. Matthew Murray’s house pioneered the use of steam and the system of central heating we use today, this earned the house the nickname ‘Steam Hall.’ Later sources show Murray’s house as being much further from the works, where it wouldn’t have been able to use steam from the works boilers, on a site that was later enclosed by the triangle of railway lines of Whitehall Junction. 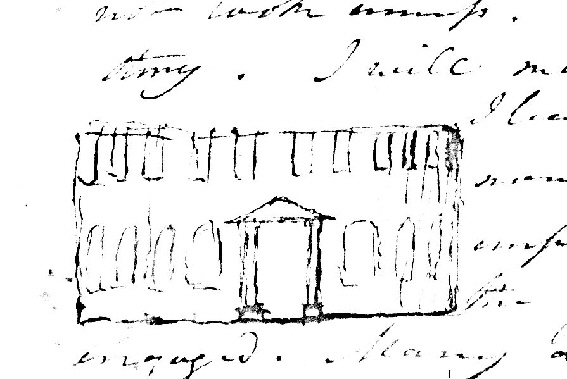 It would seem that this original house, shown in Watt’s sketch, may have been sacrificed to allow for the expansion of the works. Though the firm continued to enjoy the success of their stationary engines, Murray’s attention turned to other applications of steam and some particularly notable examples in 1811 and 1812 for which the firm is now famous. The most famous machine produced in the Round Foundry is almost certainly the locomotive Salamanca, the first of four locomotives for the Middleton Railway and as a consequence the first commercially successful steam locomotive. It is worth pointing out that Salamanca didn’t receive her name when first completed and was named in celebration of Britain’s victory at the Battle of Salamanca in Spain which took place some months later. The second Middleton locomotive was delivered around the same time as the news of the victory at Salamanca and was apparently given the name Prince Regent. This timing of events has led to speculation that the locomotives might not have been named in the order we think they were. The first locomotive was built by Richard Trevithick, however it was not particularly powerful and the tracks broke under its weight. Trevithick built a few machines, one famous example was Catch Me Who Can, which really was rather like a fairground ride in London. It could well be this engine that caught the eye of Charles Brandling, an MP and also owner of Middleton Colliery. Alternatively it could have been a Trevithick engine constructed in Gateshead that attracted the attention of colliery manager John Blenkinsop, either way it soon became apparent that these engines could be put to use at Middleton Colliery. The colliery already used steam powered winding machinery in at least one of its pits and when Blenkinsop patented his idea of using a rack and pinion railway he noted that steam would be the ideal power for this system. The colliery was situated a few miles out of Leeds and it was largely dependent on its railway. It was the first railway scheme to obtain an act of Parliament in 1758, to get the coal to the town. The Napoleonic war had led to a shortage of horses and feed, and consequently an increase in the cost of running the railway. The use of a cog wheel and teeth on one of the tracks gave the engine greater traction and the use of two cylinders instead of one removed the need for a large heavy flywheel. 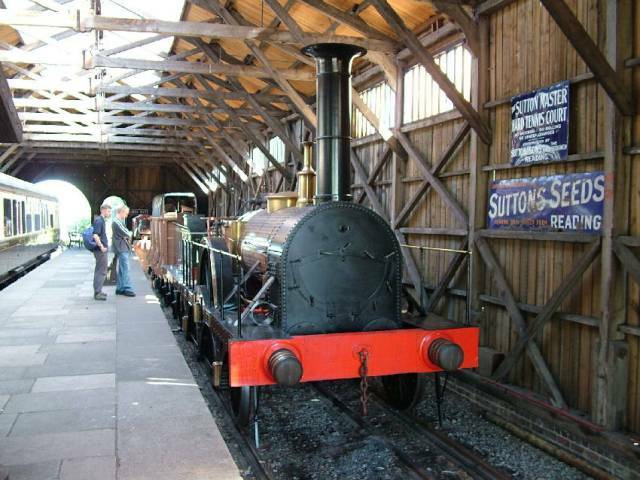 John Blenkinsop patented the rack idea and work begun on producing the world’s first steam railway. John Blenkinsop’s patent only covered the rack and cog wheel system. The development of the engine itself was up to Matthew Murray. Experiments with locomotive designs were carried out at the works and the first of four engines for Middleton Colliery was begun in 1811. The introduction of rack engines meant the railway had to be completely rebuilt and it wasn’t until June 1812 that the first steam train ran. For the first time the steam railway engine had been successfully applied to hauling regular freight trains. 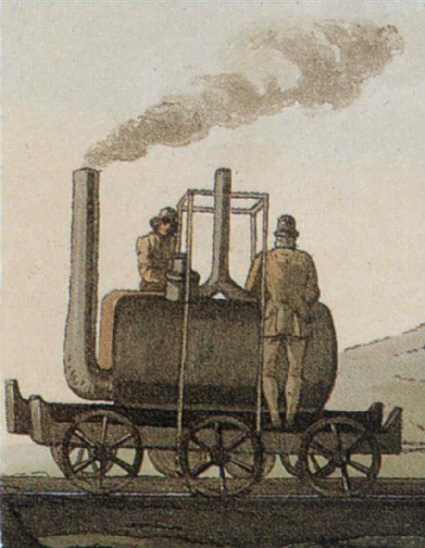 Above - Detail from painting ‘The Collier’ in the 1814 book ‘Costumes of Yorkshire’ showing one of the Round Foundry built locomotives. The introduction of this steam railway led to a great deal of public attention and word soon spread. Leeds Mercury of June 27th 1812 records the events of the introduction of the steam engine to the Middleton Railway. On Wednesday last a highly interesting experiment was made with a Machine constructed by Messrs. Fenton, Murray and Wood of this place under the direction of Mr. John Blenkinsop, the Patentee, for the purpose of substituting the agency of steam in the conveyance of coal on the Iron Railway from the mines of J.C. Brandling, Esq., at Middleton, to Leeds. This machine is in fact a steam engine of four horse power, which, with the assistance of cranks turning a cog-wheel and iron cogs placed at one side of the Railway, is capable of moving when lightly loaded, at the speed of ten miles an hour. At four o'clock in the afternoon, the Machine ran from the Coal Staith to the top of Hunslet Moor, where six, and afterwards eight waggons of coals, each weighing 3¼ tons, were hooked to the back part. With this immense weight, to which, as it approached the town, was superadded about fifty of the spectators mounted upon the waggons, it set off on its return to the Coal Staith, and performed the journey, a distance of about a mile and a half, principally on a dead level, in twenty-three minutes without the slightest accident. The experiment, which was witnessed by thousands of spectators, was crowned with complete success, and when it is considered that this invention is applicable to all Railroads, and that at the works of Mr. Brandling alone the use of fifty horses will be dispensed with, we cannot forbear to hail the invention as of vast public utility, and to rank the inventor amongst the benefactors of the country. The experiment having proved a success, two more locomotives were built for Kenton and Coxlodge and Willington took up its duties in Leeds. It was in the Tyneside area that George Stephenson saw Willington in action, he was adamant that he could make a better engine himself. His first attempt Blucher relied on adhesion rather than a rack wheel and as a result was not as powerful as the Middleton engines. A few examples of the Murray / Blenkinsop engines were built for the railway between Orrell and Winstanley Colliery and the Leeds & Liverpool Canal, though these were constructed by the Haigh Foundry, the first locomotives built in Lancashire. Two of these are said to have worked until 1852. It is not certain how many of this design of engine were built in total, a couple of them were built in Germany although they were not said to be successful. These would be the first locomotives to be built in mainland Europe. Matthew Murray comments in one of his letters that he had sent a model of the Blenkinsop engines to Russia. The Czar had himself visited the Middleton Railway in the early days of steam and was keen to introduce the technology to Russia. On the 28th February 1818 Salamanca's boiler exploded, killing its driver. This was no fault on a part of the workmanship of the Round Foundry, the driver was known to keep the boiler pressure too high. He also didn't make proper use of the safety valves. A verdict of accidental death was recorded at the inquest. There was another explosion in 1834, by which time the engines were in a poor state of repair. That accident killed James Hewitt, the first man in the world who could be described as an engine driver. The following year saw steam haulage abandoned for a number of years. Although he wasn’t the first to do so, Murray also turned his attention to steam powered boats for a time. He built a steamboat called Experiment in 1811 using the hull of captured French boat L’Actif. After testing on the canal next to his works, this boat was used on ferry services at Great Yarmouth. Following an order from Francis B. Ogden, the United States Consul in Liverpool, Murray designed engines were also put to use on a number of the first Mississippi steamers with Ogden having patented Murray’s engine design in America. Being a friend to Simon Goodrich, engineer and mechanist to the Navy Board, Murray was keen to sell the idea of steamboats to the Navy as the letter of 1815 below shows. It is interesting to note that Murray believed the engine should be contained in a separate Tug that would tow vessels, firmly believing that to place the engine on the ship itself would be ‘objectionable.’ The great steamships built decades later would prove this belief unfounded. I hope you will excuse the liberty I take in writing to you on the subject of what is called Steam Boats. It occurs to me they might be used with great Advantage in his Majesty's Navy if properly introduced, and as you are in a situation where the Introduction might properly come under your department, I beg your attention to the following Remarks I wish to make on that Business, viz. Might not the Power of a 40 or 60 Horse Engine say with two 20 or 30 Horse Cylinders, be applyed on Board a Gun Brigg to work 4 Powerfull water wheels two at each end of the vessel. The vessel to be fit up merely for carrying the Engine and its Machinery without any Masts or Rigging, and the Crew only to consist of Pilot and Enginemen, might not this vessel be employed as a moving Power, in taking in and out of Port in all winds, the Men of War ships that may be coming to be refit, or to take out to Sea, or Indeed to bring in at all times any small craft bringing Stores to the Dock yard, that may be prevented getting in otherwise, and as the Steam Engine is so generally useful, might it not be used in a many ways in his Majesty's Fleets. I do not mean on Board the Fighting Men of War, where it will always be objectionable, but as conductor of Fire ships, and as an auxiliary or attendant for various Purposes, which would be easier pointed out by Sea-men, such a vessel might attend the Embarkation and delivery of Stores, ordinants &c., working merely as a labourer by which means a great deal of time might be saved. As these vessels will be adopted sooner or later in the British navy I should be glad of your Opinion on the subject. I merely mentioned a Gun vessel as being perhaps the easiest to obtain, to make the Experiment of, if it may be so called, whose effects are certain, I am apprehensive that the Power & motion of the wheels in the water, would be a great preventitive of the vessel being destroyed in a Storm, and might be made the safest vessel that can swim, and from its great Power might be made to keep company with any Fleet of Ships. We have a Steam Boat for Passengers that works between Hull and Gainsbro' that answers the Purpose exceedingly well, but I strongly recommend having the Engine in a vessel by itself and taking the other vessels or Packets in Tow, the favour of your answer will much Oblige, Your Obt. Svts. for Fenton Self and Wood, MW. MURRAY. It would still be a number of years before the Navy went in to steam ships in a big way and little more is said of marine engines at the Holbeck works. 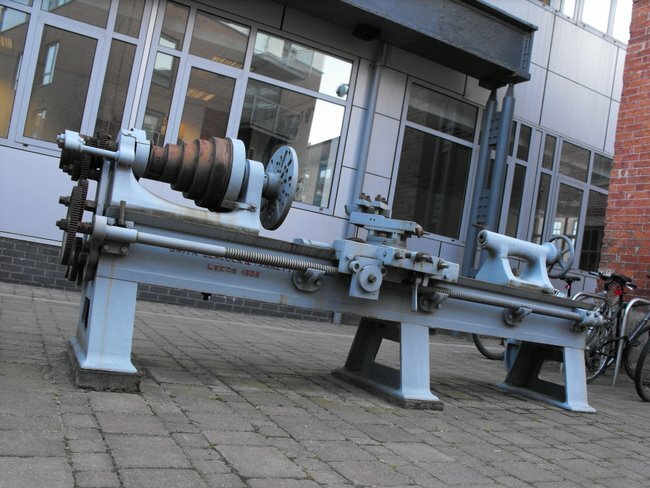 Some work was gained from the Navy but this was in the form of machine tools, one notable example being a hydraulic press in 1825 for testing chains. Little also is said about Railway engines either, the works continuing with its core business of mill machinery. In 1825 he suggested a design of locomotive for the Stockton & Darlington Railway. This would have been an articulated locomotive with the boiler carried on one set of wheels and the engine itself on another. This design was not developed any further. "...I don't see any objection why they might not be made to go upon a macadamized road, if a motion was given to all the 4 wheels at one time, & made with broad Surfaces. The objection to locomotive engines is, that they must be worked with high pressure steam, say from 40 to 60 pounds upon an inch, above the atmosphere, & of course require strong boilers, & other Parts, which makes them a very objectionable weight - those we have already made, including the water they carry, are not less than 6 Tons for the power of six horses. I am afraid nothing can be done by Mr. Perkin's scheme without increasing the danger, however a steam carriage would have been the best to have made his experiment upon, as he pretends to get great power, with little room & no danger. This I cannot understand & in the absence of direct experiment he cannot satisfactorily explain. There is another, Mr. Brown's Explosive Gas Engine - this is not original, as it was attempted at least 40 years ago although rather different. - The principle was to drop, by drops a bituminous or inflammable substance on a red hot Plate, at the Bottom of a Cylinder, at the same instant an admission of air caused it to explode & force up the Piston." This is another idea that was not taken further. On the 20th February 1826 Matthew Murray died. 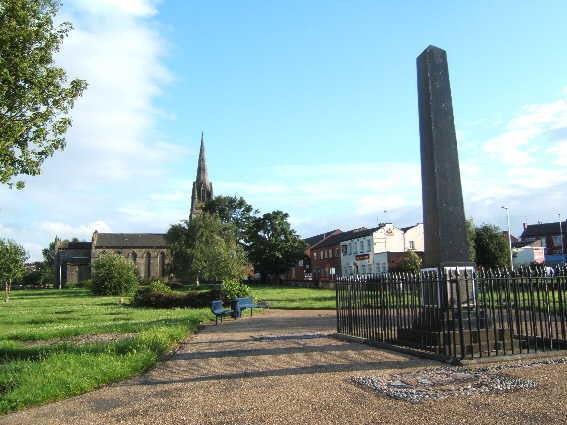 He was buried at St Matthew’s church in Holbeck and the grave was marked by a cast iron obelisk produced by his workers. Matthew Murray left a son, Matthew Murray Jr. Born in 1793, Murray Jr served his apprenticeship in his father’s works and established a works in Moscow in 1821. He died in Moscow in 1835. Murray also had three daughters, the eldest, Margret, married Richard Jackson who became a partner in the firm. The firm had been renamed Fenton, Murray & Jackson following the death of Wood in 1820. Under the new name a return to locomotive construction was made, largely subcontracted work from Robert Stephenson’s at Newcastle. Locomotives were built for a number of railways including the Liverpool and Manchester, the Leeds and Selby and also the broad gauge Great Western Railway as well as several examples for overseas companies including many for France and one of America's earliest locomotives. One order for the Sheffield and Rotherham Railway's 2-2-2 locomotive "Agilis" in 1839 was followed by another order in 1840 which for reasons currently unknown Fenton, Murray & Jackson subcontracted to Leeds Engineering firm Bingley & Co on Harper Street. This follow up order was presumably to the same design and emerged with the name "Rotherham." 1840 would prove to be the Round Foundry's busiest year in terms of locomotive production so perhaps this already quite outdated works was at its capacity at the time. The 20 Great Western Firefly locomotives built at the Round Foundry were considered by Superintendent of Locomotive Engines Daniel Gooch to be the best of the class. Leeds built Phlegethon hauled Queen Victoria on her first ever train journey and Ixion was chosen to represent the Great Western’s broad gauge in the Gauge Trials. As the Morning Chronicle on December 17th 1845 records the engine even had VIPs on the footplate for one of the trial runs. "The engine chosen was the Ixion, with machinery of immense power, She was driven by Mr. Brunel and Mr. Gooch"
Ixion won the trials proving that it could achieve greater speeds than a Stephenson built locomotive built to standard gauge. The test ought to have been quite fair as the two designs of locomotive would, apart from their gauge, have been very similar. Though it is mentioned in accounts of the trials that the broad gauge locomotive had to overcome greater wind resistance due to wind conditions at the time, and of course its larger surface area. The Newcastle Courant of January 16th 1846 mentions the results of the gauge trials, though these are in fact averages taken from several runs. "The speed gained by the broad-gauge engine, loaded with 400 tons was rather more than 24 miles an hour. The speed reached by the narrow-gauge engine, with the same weight, was about 19 miles per hour"
Several important engineers gained experience at the Round Foundry and the company which had been key to the birth of the railways also sowed the seeds of a number of the early manufacturers of railway engines. Richard Peacock was an apprentice at the works before going on to be Locomotive Superintendent of the Leeds & Selby Railway. He eventually established the Beyer Peacock engine works at Gorton with partner Charles Beyer. Another notable engineer to gain experience at the Round Foundry was Benjemin Hick. John Chester Craven went on to be Locomotive Superintendent of the London Brighton & South Coast Railway after his engineering upbringing in Leeds. In later years when the works was in fact under different owners Alfred Krupp sent his sons to the works for their apprenticeships. David Joy was another notable apprentice, creator of Joy Valve Gear and designer of the Jenny Lind locomotives at the Railway Foundry in Leeds, much more about his time with this company is covered in their own chapter. In his diaries David Joy records the day he was first taken to the Round Foundry. "…I was asked if I would like to be an engineer. And the authority set my chief friend, the millwright, John Kirk, to sound me, and to take me to see the engine works of Messrs. Fenton, Murray & Jackson, of Leeds. This happened one fine sunny afternoon and all looked couleur de rose. There were several big locomotives building for the Great Western Railway, of the "Argus" type in all stages of completion. Of course I was caught, and on my return frankly admitted how much I had been delighted, and how I would like to be an engineer"
Another of the key figures to come out of the Round Foundry was Charles Todd who went on to found Leeds engine builders Todd, Kitson & Laird, Shepherd & Todd, and The Sun Foundry. Again these works are covered in their own chapters. The fact that these separate companies were founded was largely an effect of strike action in 1837, many of the best engineers moved on, many of them to the Hunslet area of Leeds. Over the next few years there would be two large engine making firms establishing themselves in the Hunslet area. Although the firms seemed to have been friendly towards one another it certainly wasn’t good for business at the Round Foundry. In the later years not all the Round Foundry engines were a resounding success either. Four of 2-2-2 locomotives built for the London & Southampton Railway in 1840 were a great disappointment. They were extensively rebuilt at Nine Elms, despite this they were still withdrawn in the 1850s. When the Hull & Selby Railway wanted to try out 'Grey's Patented Expansion Gear' they did it by comparing their new Railway Foundry locomotives featuring Grey's gear with the slightly earlier Round Foundry locomotives that had been built to a design previously used on the Leeds & Selby Railway. Grey's gear won the trials and the reports in the papers reflected badly on the Round Foundry. "These engines finished, slack times began, and autumn and winter passed very drearily away. There were three of us apprentices at the works, and, being too far from home to return for meals, we fed in one of the workmen's houses close by. Breakfast, 8 to 8.30; dinner, 12 to 1; afternoon tea, 4 to 4.30; works closing at 6 and opening at 6 a.m. Catering thus together we did it for about 6s. 0d. per week. Saturday closing time was 4 p.m."
Things didn’t improve and Fenton, Murray & Jackson went bankrupt in 1843. "Spring came, and times were slacker. Finally Mr. Jackson sent for me to tell me that they were going to close the works, so I should not be wanted." A small part of the site was used by a number of firms for a time, being described as having become in effect one of the earliest industrial estates. Most of the site remained unoccupied for some time though, despite regular advertisements in the local papers. The firm of Smith Beacock & Tannett went on to take over most the complex and it continued to be used for manufacturing machinery, though no more steam engines or locomotives would be built there. The works was renamed the Victoria Foundry. A short time after Beacock and Tannett took over the works part of the site was destroyed by a massive boiler explosion. A verdict of accidental death was recorded at the inquest. The cause was put down to a dificient supply of water. Sadly the trademark Rotunda burned down in 1875, the unusual shape of the building played a major part in its demise as the Leeds Mercury report of 29th September 1875 records. "A destructive fire occurred last evening at the extensive works of Messrs. Smith, Beacock and Tannett, in Water-lane, Leeds. The fire was descovered about eight o'clock in the top story of which is known as the "Old Round Foundry." The fire brigade where at once apprised of the occurrence, and in the meantime all the available hose on the premises was immediately got in to play upon the flames. The building is four stories high and circular in shape, and the hose being brought to the top by the winding staircase became so twisted that there was little or no pressure of water." In to recent times the works site has continued under various owners and various trades from motor mechanics to mineral water bottling. In later years some of the buildings were becoming quite delapodated however they have been restored recently and see new use as offices, shops, pubs and restauraunts. The destruction of parts of the works mentioned above resulted in redevelopment of parts of the Round Foundry site, however many of the original buildings survive to this day and a number of plaques mark the historic buildings that can still be seen. The early works layout can still be appreciated where, unlike the large shop floors of later works, the various trades involved operated around traditional yards. Names like Saw Mill Yard and Foundry Street can be seen. There are no surviving locomotives from these companies, only the stationary engine mentioned above, an engine in America and a model in Russia that we are aware of. More details regarding the last two would be appreciated. Entering FMW or FMJ as builder in our Engine List will produce a list of the 7 Blenkinsop rack engines and 70+ Fenton Murray & Jackson engine we are aware of from various publications and early railway company records. In the Articles/Brocures section we have an article written for the Middleton Railway's Old Run magazine to commemerate the First train ride of Queen Victoria which was hauled by a Round Foundry locomotive. The Picture Gallery Contains some old illustrations of the Round Foundry engines as well as pictures of the modern replicas of designs constructed at the works and the works site today.